All of the technicalities in the world are out the door. All of the interpretations are no longer relevant. Paperwork no longer matters … the 2017-18 basketball season saw Westchester Community College take to the court for 26 games, and 26 times the Vikings outscored their opponent. When it came to the actual competition, Westchester CC went undefeated. It is plain and simple. And nobody can ever take that away from a group of young Vikings who will never be forgotten for their unbeaten achievement. The record book may officially read “18-8” but an entire community will always remember 26-0. An outstanding effort on Tuesday night made sure of it. Tremaine Fraiser (Port Chester, NY/Trinity Catholic) was one of these sophomores, and on Tuesday night continued his mastery of the season, saving his best for last with a career-high 30 points, 21 of which came during the second half of play. Known more as a slasher than a shooter, Fraiser hit four three-pointers against Bergen Community College, every one of which came in handy as the host Bulldogs put up quite a fight. Another sophomore, Raykwon Fenton (Bronx, NY/Holcombe Rucker HS) was absolutely brilliant during the home stretch of the season, a brilliance that found its way to New Jersey on Tuesday as Fenton scored 17 points, including 11 during the first half when the Vikings got off to a slow start, but rallied for a 45-35 lead at halftime. And then there were Gabriel Cruz (Bronx, NY/In-Tech Academy) and Pierre Lys (Greenburgh, NY/Woodlands HS). Are there two players on the team who came as far as this duo as the season went along on both sides of the court? Cruz was as good as ever on Tuesday, scoring 12 points, 10 of which came during a huge second half, while Lys finished with 12 points, but did all of the little things as usual to help lead WCC to victory. Overall, 10 different Vikings scored during the win. The only bad news that came on Tuesday night was that the season ended. As a first-year team, NJCAA rules prohibit Westchester Community College from competing in the post-season. However, if Westchester Community College proved anything this season, it is that the playoffs are coming for this program, likely coming every year, and that this is a program capable of competing on the national level very soon. And when that does happen, history will remember where and when the journey began … it was 11 young men who chose to start the program from scratch in 2017, and never lost a game*. TUESDAY FEBRUARY 20TH – Shanaya Jones (Bronx, NY/Health Opportunities HS) scored 16 points and added 15 rebounds, and Paige Collins (Jamaica, NY/Wadleigh HS) had 10 points and 17 rebounds, but the Westchester Community College Women’s Basketball team lost 74-52 to Bergen Community College on Tuesday night at Bergen. With the loss, the Vikings fall to 1-14 for the season. WCC got off to a strong start, taking a lead into the second quarter, but a 10-0 Bergen run to open the second quarter put the hosts ahead for good. Bergen led 40-26 at halftime. WCC was able to outscore Bergen during the fourth quarter to keep things close. Denise Crockett (Mount Vernon, NY/Thornton HS) had a strong game for the Vikings with 15 points. THURSDAY FEBRUARY 22ND For four Westchester Community College sophomores playing their final home game, the results of the season were far more important than the outcome of a game as Thursday night in Viking Gymnasium represented a celebration of a job well done. After three years without a team, Westchester will complete a full slate of games during their first season back on Saturday when the Vikings travel to Nassau Community College. For one last night on the home court on Thursday, WCC saluted its graduating class for putting in the effort, and displaying the perseverance to set up what promises to be a successful future for Women’s Basketball in Valhalla. Before Westchester took to the court and lost to Monroe-Bronx, 58-39, WCC honored Gisselle Mora (Ossining, NY/Ossining HS), Dhamar Sarmiento (White Plains, NY/White Plains HS), Jada Crump (White Plains, NY/White Plains HS), and Alexandria Knight (Briarcliff Manor, NY/Putnam Valley HS) for all they have done to get Women’s Basketball back on the floor for Westchester CC. And for 40 minutes, the Vikings did as they have done all season, they battled every step of the way, outscoring an opponent during the fourth quarter. Unfortunately, a hot-shooting Monroe-Bronx team proved to be too much, but the effort was certainly there. Shanaya Jones (Bronx, NY/Health Opportunities HS) led WCC with nine points, all of which came during the second half, while Knight and Paige Collins (Jamaica, NY/Wadleigh HS) scored eight points apiece. During her final appearance in Viking Gymnasium, Crump scored four points, which marked a career high. The game opened very much back-and-forth as Monroe led 12-8 after the first quarter, and extended the lead to 39-28 at halftime, but the issue was still in doubt. A 19-4 third quarter allowed the Express to pull away for good. With seven players slated to return and an outstanding recruiting class on the way, Westchester Community College Women’s Basketball did the hard part in 2018 … they brought basketball back to WCC, battled with the toughest teams in Region XV, and won a game. Now, the Vikings look forward to year two with a strong nucleus in place that set the stage for a very successful future. 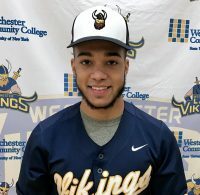 WEDNESDAY FEBRUARY 21ST The Westchester Community College Baseball team opened the 2018 season on Wednesday, February 21 losing both ends of a doubleheader to national powerhouse Mercer Community College. The Vikings battled during the opener before falling 5-1. Mercer, ranked #3 in the NJCAA after advancing to the 2017 National Championship Game, won the nightcap 10-0. The games were played at Diamond Nation in Flemington, New Jersey. WCC amassed 11 hits during the opener, but struggled with runners in scoring position, hitting into three double plays that proved to make a huge difference during a game when the Vikings trailed 2-1 as late as the sixth inning. A three-run home run by Mercer in the bottom of the sixth broke the game wide open. James Houlahan (Yorktown Heights, NY/Lakeland HS) went 2 for 3 with an RBI, and Christian Lovecchio (North White Plains, NY/Valhalla HS) went 3 for 3, and Jose Delacruz (New York, NY/George Washington HS) went 2 for 3. Sophomore Nick Cona (Cortlandt Manor, NY/Walter Panas HS) pitched a strong game for Westchester, holding a potent Mercer line-up in check for most of the game, and giving the Vikings a chance to win. The second game was a different story as the hosts enjoyed a big game at the plate. For WCC, Lovecchio, Scott Giordano (Croton, NY/Croton Harmon HS), and CJ Sager (Mahopac, NY/Mahopac HS) each had hits during the loss.